The Super Bowl is right around the corner, and chances are that, football fan or not, you’re going to be watching it. If heading down to a sports bar sounds stressful and none of your friends are willing to host, that duty might fall on your shoulders. Now you have to worry about food, parking, unwanted guests and seating. 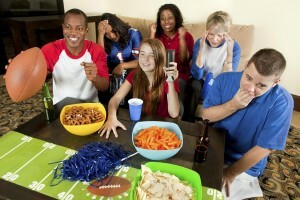 Living in an apartment can make Super Bowl party hosting difficult, but it’s certainly not impossible. The Super Bowl isn’t your average football game. With a few simple decorations, you can jazz up your apartment to reflect the excitement of the game. There’s no need to spend massive amounts of money decking your apartment out in Seahawks or Patriots gear, but you can pick up football themed napkins, plates and cups to get everyone excited and make your cleanup easier. Tiny apartment kitchens are not exactly the best when it comes to creating delicious game day food to satisfy all of your guests. You can prepare a few dishes, buy some simple veggie trays or have your event catered. Either way, it’s okay to ask your guests to chip in a bit. If everyone brings something it will cut your costs and create a delicious variety of snacks to choose from. Apartments often don’t have the spacious living rooms that many larger homes do. Asking your guests to squeeze in or sit on top of each other will not make for the ideal game watching atmosphere, so get creative. Provide pillows to make the floor a bit comfier, and consider breaking out some bean bags. If any friends have small seating options that they can bring early, ask them to do so. Hopefully your guests won’t end up accidentally elbowing each other in the face. With such limited space, you may want to restrict your guest list. Determine a comfortable number and ask your guests to respect it by not adding bringing extra people. Encourage carpooling, as you likely won’t be the only person in your complex hosting a Super Bowl party. Let your guests know where to park to avoid towing. Another important step to take on the road to party planning is to alert your neighbors. If you know that your neighbors prefer a quieter living space, let them know ahead of time and take steps to keep the noise level down. You obviously can’t be as quiet as you are on your average Sunday, but good communication is the neighborly thing to do. This entry was posted on Monday, January 26th, 2015	at 3:29 pm	. Both comments and pings are currently closed.